Learn from this expository guide to the book of Daniel how to live for God in a world that is hostile towards him. We live in difficult times to be people who obey God and worship him alone. How can we be confident under pressure and faithful in the fire? 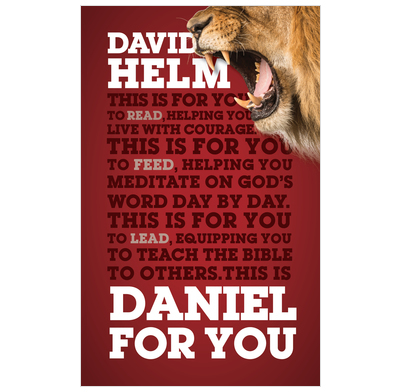 In this readable, accessible, exciting volume walking through one of the best-loved books of the Bible, David Helm shows how Daniel and his friends learned how to live in Babylon, far from their home in God's land—and how we can do the same. I'm a huge fan of the God's Word for You series. They provide helpful summaries, notes to consider, cross-references, and application questions. The volume on Daniel, however, has been my least favourite. It does a fine job to engage with history and the text, however, I find some of the Christ connections in this book somewhat lacking. It is a helpful resource if it's your first time to read Daniel, but I would recommend further study on your own to truly understand how each passage points to Jesus. Love this thoughtful approach to the Book of Daniel. David Helm constantly reminds the reader of our relationship to Christ and draws us to see the need to be in right relationship with Him. Wonderful for preparing studies in Daniel for a small group. When you are living in a world where the government seems bent on destroying their own people Daniel is a perfect book to show a different perspective. It challenges our roles as Christians in an unholy world. Thank you!!! !